Welcome to Week 25, Year 5 at PPF! This week our random number generator chose #36 - Connie Powell. 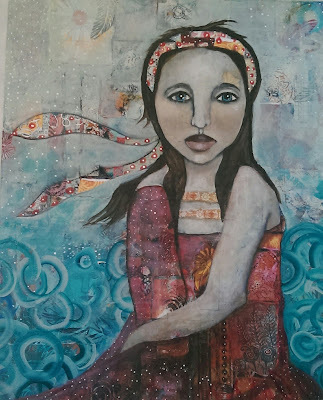 Inspired during her trip to the Outer Banks, Connie created this lovely multi-media painting. Can't you just feel the ocean? Welcome to Week 24, Year 5 of Paint Party Friday! This week, the random.org number generator chose #50: Stephanie Schutze. 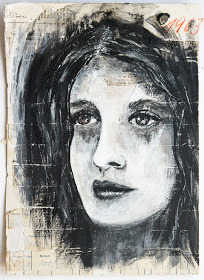 Last week Stephanie shared a beautifully thoughtful portrait painted in grayscale. Please be sure to stop by her blog to see what she painted it on. Have a thoughtful and creative week! Welcome to Week 23, Year 5 of Paint Party Friday! This week random.org has chosen #5 - Sal Scheibe. 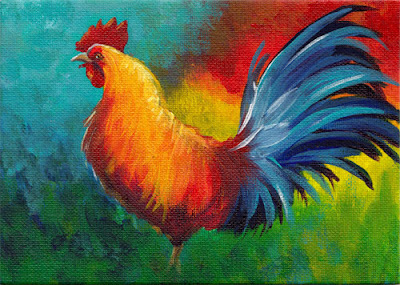 Sal had a wide variety of art to show us - a series of marker and ink Goth Girls, a graphic set of peonies to colour and this vibrant and colourful acrylic rooster painting. Please drop by and check out the rest of her creations! Welcome to Week 22, Year 5 of Paint Party Friday! This week, the random.org number generator chose #39 Tammie Dickerson. Tammie is positively prolific with her plein air paintings, and last week she shared her 941st painting in 941 days! It is an amazing landscape painting that she painted from on a beautiful cliff. Please be sure to stop by her blog to read about her location and see photos of her easel set up on the cliff.